A commuter has won a landmark legal victory over a train company after discovering he could save hundreds of pounds buying his season ticket from a different station. Lawyer Andrew Myers successfully sued First Capital Connect after discovering he was paying £700 more than the cheapest available ticket on his route — and today he urged thousands of other travellers to take advantage of the ruling. The company initially tried to settle the case out of court and use a gagging order to stop him discussing it. But Mr Myers wanted his day in court and not only won, but was also awarded costs of £2,193 after a St Albans county court judge ruled the train company’s behaviour was unreasonable. The victory has left train operators trying to close “loopholes” which could force them to slash the cost of season tickets for thousands of people. Mr Myers, who lives in St Albans and works in the City, took the company to court after discovering he could buy a season ticket from Watford North, which is closer to London, and use it from St Albans. The Watford North ticket, costing £3,068 a year, was £700 cheaper than the St Albans version. When challenged by a FCC official, who said he had to buy a separate ticket, Mr Myers issued proceedings against the company in March. He obtained correspondence to and from FCC’s parent company First Group which said the loophole in the planner — which put St Albans on the route into London from Watford, even though it was further away — must be closed immediately as “the financial implications are massive”. The Department for Transport said it was “currently assessing a request” by the Association of Train Operating Companies to close the loophole, meaning other commuters from St Albans could demand similar reductions. Mr Myers said: “It is outrageous that FCC have been selling season tickets for £700 more. I did not think it right that they could buy my silence.” The FCC said Mr Myers had uncovered “a previously unknown historic routing guide error that harks back to the days of British Rail”. Asked if commuters should have been made aware of the cheaper season ticket option as soon as FCC discovered it, a spokesman for FCC said: “Probably no”, saying the routing information was clearly an error which needed to be fixed. A spokesman for FFC said confusion over the status of the loophole arose because they they were told by ATOC in March it had been had been closed. He added that they did not “proactively broadcast” the possibility of a ticket to Watford North also allowing travel to St Albans as it was “an error” and would not have shown up in computers as a possibility for anyone asking for a ticket to and from London and St Albans. An ATOC spokesman said: “This is an example of a very obscure error in a system that offers millions of tickets for travel between more than 2,500 stations. CrossCountry, part of leading transport group Arriva, has welcomed the Department for Transport’s announcement that the train company will lead a trial which will see Advance train tickets for sale on the day of travel. This initiative, which was part of the Department for Transport’s Rail Fares and Ticketing Review, will see CrossCountry introduce across all its longer distance routes the opportunity for passengers to buy discounted ‘Advance’ tickets as close as 10 minutes before their train departs. Starting 13 October 2013, the trial has been made possible through CrossCountry’s introduction of ground-breaking technology to the British rail industry representing some £1 million investment in technology by the train company. 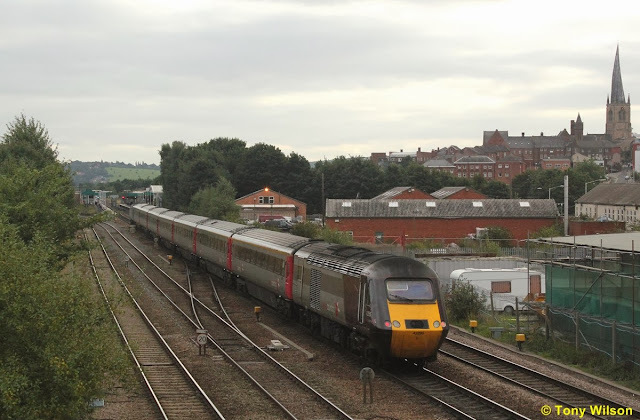 One wonders how this will affect passengers that use services such as the 1442 from Newcastle to Plymouth (arrival 2146), shown here as it passed through Chesterfield at 1706 on the 20th September last.